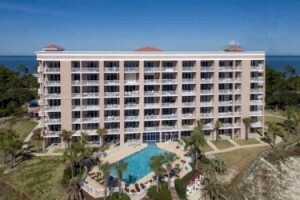 Gulf Shores condo for sale at The Dunes. Nestled high on the dunes, this 1 BR beach resort property features gulf views on the large, private balcony – the sunsets will take your breath away. Pet-friendly – okay to bring the family pet for owners and renters! Cheerful, open floor-plan offers high ceilings, floor to ceiling glass, and plenty of room to relax and soak in the beautiful views of the gulf and coastal environment. Luxury master has tropical decor with a private en suite bath, with views toward the bay. -> Bunk room is ideal and the perfect place for a good nights sleep with an adjacent bath. Large entrance to the residence plus a full-size clothes washer & dryer for additional convenience. Come see this condominium home today!